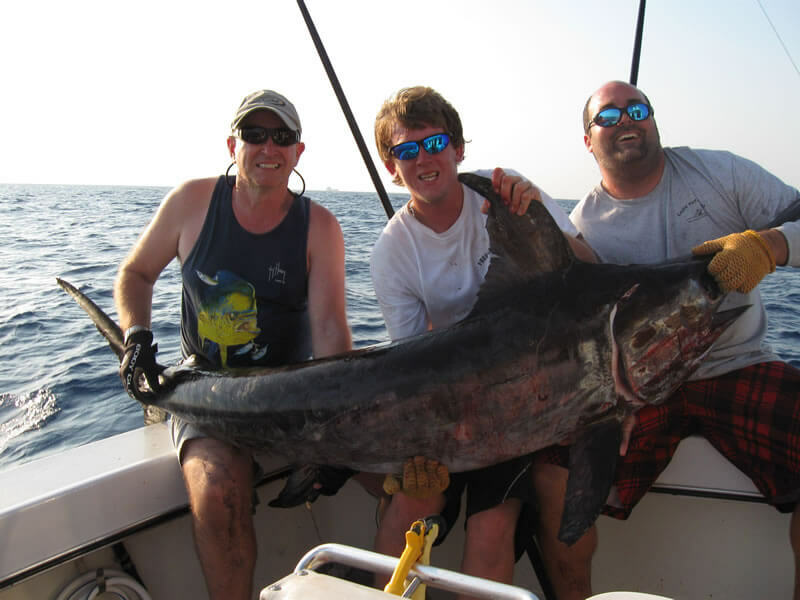 Swordfish have become one of the most popular and sought-after gamefish in the world. Swordfish can be found in deep waters throughout the world. However, the Fort Lauderdale and Miami fishery has become the epicenter of chasing the Gladiator of the Sea. Swordfish are incredibly strong and stubborn fighters yet also possessing blistering speed. Once hooked, a Swordfish battle can last hours. With their ability to jump from the sea, Swordfish offer the ultimate offshore challenge while deep-sea fishing out of Fort Lauderdale. Swordfish are chunky, stocky and powerfully-built fish. The distinguishing feature of Swordfish is the huge bill or “sword” protruding from the fish’s face – much longer and wider than the bills of Marlin and Sailfish. The bill is used to kill prey. When feeding, a Swordfish rises from beneath a school of fish, swinging its sword from side to side, striking at any fish within reach then consuming the stunned or dead prey. 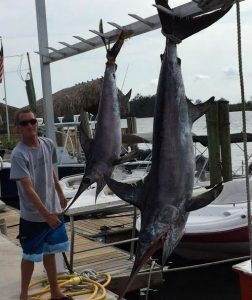 Daytime Swordfishing has quickly grown to become the preferred way to catch Swordfish off the Florida coast for many local anglers, especially here in Fort Lauderdale. We have been innovative in tweaking our own Swordfish tactics and have met with great success. Swordfish are primarily night feeders, but it seems as if Daytime Swordfishing is leading to much larger Swordfish being caught off of Fort Lauderdale and Miami. Similar to Nighttime Swordfishing, we’ll run 14-16 miles off the coast of Fort Lauderdale to the middle of the Gulf Stream current and fish in depths of 800 feet -1,800 feet. This is where the similarity ends. We only fish one rod on the bottom with surface baits for by-catch. 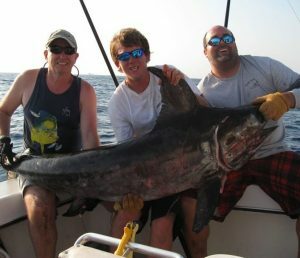 There is also a great chance of hooking a Marlin while you’re deep-sea fishing offshore during daylight hours. We can offer both manual or electric reels, depending on your preference. 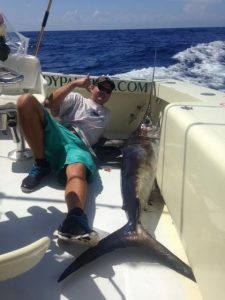 Just keep in mind that your Swordfish bait is a LONG way down and it’s more than likely you’ll be passing the rod to your buddies before the Swordfish – or even the bait – will make it to boatside! Whether you choose to go Nighttime Swordfishing or Daytime Swordfishing, it’s a great way to catch a world-class game fish, right off Ft. Lauderdale’s coast. We fish in depths of 800 feet -1,800 feet, 14-16 miles off the coast of Fort Lauderdale to the middle of the Gulf Stream current. Equipped with top of the line Penn and Shimano tackle, be ready to endure the grueling and punishing fight these fish deliver. 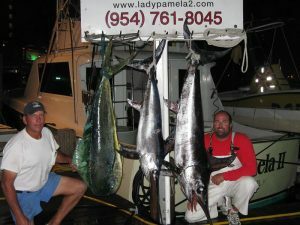 Swordfishing in Fort Lauderdale is only a one-hour run to the most fertile grounds off the Southeastern US coast. The techniques we employ include drifting in the Gulf Stream current with a variety of dead squid and live bait. The spread ranges from 500 feet depths to surface baits. Generally, we fish a spread of 5-6 lines depending on wind and current. A Hydro glow light is used to illuminate the water and attract their attention. While waiting for a bite there is an abundance of life that is attracted to the lights as well, including Squid, Mackerel, Flying Fish, Dolphin, and often our intended quarry. When that Swordfish takes the bait, there isn’t any rush in the world that can match it. Swordfish are famous for making searing runs and sounding to intense dives. Come join us to experience this amazing, prehistoric fishery!